It's late and you're in the historical archives proving to your rivals that you have the greatest lineage of them all! Over three rounds, you'll choose and pass tiles, revealing ancestors from around the world and joining them to one another. Match leaves and hearts to blossom relationships, cultivating the wealthiest and most powerful family tree. Branch out and win by sprouting generations, amassing wealth, and celebrating marriages. 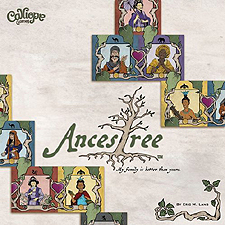 Show everyone that your family is the best of all time by growing a legendary Ancestree!